I took a different route through the park this time, heading west to The Pond, crossing it at Gapstow Bridge. Between 6.00am and 11.30am I saw 38 species. On the path towards The Pond I had a family group of Common Grackles and a few Mourning Doves. 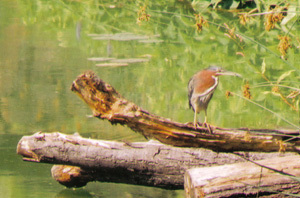 At the time I was here (2001) The Pond was almost dry and undergoing renovation: I could hear birds but couldn't see much – a Blue Jay called from the trees and American Robins could be heard singing. A sudden movement caught my eye as a Hairy Woodpecker landed in a nearby tree and quickly made it's way up the trunk and then flew off. I then walked up to Central Drive and checked out the birds on the grass around Heckscher Playground. These were Ring-billed and American Herring Gulls, plus a few American Crows and lots of Common Starlings. A group of Common Starlings and Feral Pigeons were feeding around some litter on the road. 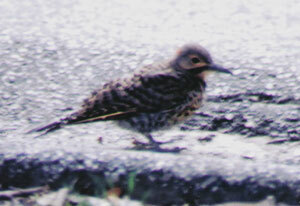 At the edge of this little group I noticed another hunched-looking bird which I realised was a Northern Flicker. I then walked around Sheep Meadow up to The Lake. Near The Lake shore, on Cherry Hill, there was a singing Song Sparrow, singing from the same tree as it was in May. I checked Wagner Cove and found Red-winged Blackbirds and a Gray Catbird, and, on the far shore, two Black-crowned Night-herons and two Yellow Warblers. A bird flew into a tree near me which turned out to be a Northern Waterthrush – my first waterthrush in a tree. Over the lake flew Chimney Swifts and one Tree Swallow. On the far shore stood a lone Great Egret. By Bow Bridge I found two Cedar Waxwings, another Song Sparrow and another Gray Catbird. Next came The Ramble, the best bit of Central Park for birds. 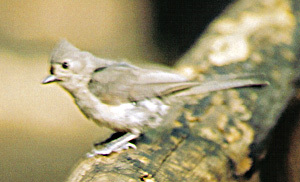 Young birds were common including American Robins and Gray Catbirds. A family party of noisy Tufted Titmice moved past through the trees and I then came across three very noisy and mostly fighting Carolina Wrens – two against one as far as I could tell. Also in The Ramble I picked up Downy Woodpecker, adult and juvenile Northern Cardinals and a briefly-drumming Red-bellied Woodpecker. Wandering randomly through The Ramble led me to The Point. This is a small peninsular jutting into The Lake. I stuck my head through the trees at the end and scared up a Black-crowned Night-heron. This bird flew around the corner and then came back again with another night-heron, both calling loudly. They settled in a tree just across the water. Also here a single Eastern Kingbird caught flies over the water from using a vantage point at the tip of The Point. Heading back, away from The Point, I had another look at through the trees just as a Red-tailed Hawk flew across and landed by another Red-tail in a nearby tree. Things then quietened down somewhat and I walked to Azalea Pond and sat down for a while to see what was about. American Robins, young and adults, were everywhere but that seemed to be the whole bird list. After about 20 minutes a first-summer male American Redstart came through showing all the yellow patches very well. Then a Tufted Titmouse appeared behind me and decided to become almost impossible to photograph by moving very quickly from branch, to wooden seat, to branch. Next came Turtle Pond where there were a couple of Red-winged Blackbirds, and singles of Canada Goose, Great Egret and Green Heron. Within The Ramble is The Gill, a stream flowing through the area. It is crossed by three bridges, one of them the excitingly named Bridge 21 (there's also a Bridge 22 and Azalea Pond Bridge). This area was good for Black-throated Blue Warbler back in May. Now in July American Robin was it. It's a nice area though and by Bridge 21 is a good site for Northern Waterthrush - I saw two here this trip. I then walked around The Great Lawn and up The Reservoir. The central strip of land held loads of Ring-billed, Great Black-backed and American Herring Gulls and a few American Crows. On the water were a couple of Double-crested Cormorants, one of which fed close to the path and showed very well, although, typically, not showing crests! Heading back to the hotel I again saw the Green Heron and Great Egret at Turtle Pond and found another first-summer (singing) American Redstart and a Pine Warbler in The Ramble.